While the Windows 8.1 Preview build has been available since July, reports are emerging that the final public update will be released in October. According to The Verge, its sources have said that October will see new 7-inch and 8-inch devices together with the OS update as well. This wouldn't be surprising, as Microsoft CEO Steve Ballmer did confirm at the Build 2013 conference in June that smaller Windows devices would be available "over the course of the next several months". In any case, an October release for the update does seem likely, with Windows 8.1 due to enter into RTM by the end of this month, giving manufacturers some time to tinker with their products before the final release. 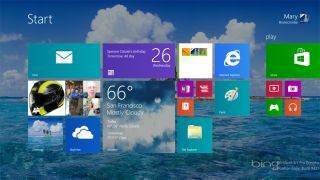 October 2013 will also mark Windows 8's one year anniversary, and the update will not only bring to market Windows devices of all sizes, it will also bring back the Start button to the desktop. From our time with the Windows 8.1 build, we found that it makes the operating system generally faster and a little quicker to navigate with more consistency throughout the interface. The interface also incorporates features found on Windows Phone 8, as well as an expanded PC Settings section and significant updates to Internet Explorer. We've been lucky enough to have had time with it, so why not click through to see what's new in Windows 8.1.